How did this patient hear about Water’s Edge at port Jefferson Rehabilitation & Nursing Center? The patient’s family was given choices by the social worker’s at Stony Brook hospital; there are several rehabilitation communities in the local area. Water’s Edge was chosen by the patient’s family because of the close proximity to her home. Mrs. Erike was admitted to our community, Water’s Edge at Port Jefferson for Rehabilitation and Nursing due to breathing complications she was having at home along with walking struggles. One night in particular, Mrs. Erike was having difficulty breathing. Her family decided to take her to the local hospital to be seen for medical care and treatment. 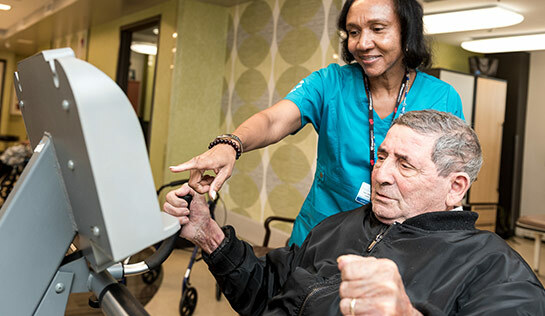 After a few weeks of treatment at Stony Brook hospital, Mrs. Erike was sent to our community due to her decreased functional mobility, a decrease in her range of motion, and a reduced ability to safely ambulate herself. The pain in her back and legs created concerns, which led to the reason Mrs. Erike was sent to our community. Upon arriving to Water’s Edge, Mrs. Erike was greeted by the concierge who ensured her that the entire staff were here to help make her stay a more comfortable one. Mrs. Erike was evaluated by our admissions nurse to inquire about Mrs. Erike’s medical history and to listen to the questions and concerns the she had concerning her care. Mrs. Erike was also visited that same day by our rehabilitation department who set forth their evaluation. After her evaluation by our physical therapy department, Mrs. Erike was given a wheelchair and a walker to begin her physical therapy. During her first week, Mrs. Erike took some time to regain her ability to stand and walk. Through hard work with our physical therapy team and her determination, she was able to get herself out of bed and into her wheelchair without much assistance from our nursing staff. Mrs. Erkie was beginning to regain her ability to stand confidently. During her second and third weeks, Mrs. Erike was working towards her goals to safely perform functional activities with safety awareness. With decreased complaints about pain and with decreased assistance from caregivers, she was truly working towards gaining her prior level of independence. After two more weeks of physical and occupational therapy, Mrs. Erike and her family were excited with the level of improvement she had made. She went from not being able to walk at all, to having a baseline of walking 60ft with the help from our communities therapy department. She made substantial improvements in her ability to walk by the end of her stay. Mrs. Erike was able to walk 150ft to an astounding 175ft and she also was able to dress herself! During her stay, we as a team were able to accommodate Mrs. Erike’s meals in order to keep her nourished for physical therapy and daily activities. We were able to accommodate her with alternate meals other than what was being served due to the fact that Mrs. Erike suggested that she rather have a sandwich for lunch and hot tea with every meal. We have the duty to ensure to make any changes to accommodate the high level of comfort we provide. The day came for Mrs. Erike to return home and she was grateful about the progress she had made.With the help from our staff, she was able to receive a walker to take home with her for extra support if she needed it. She also received instructions on continuing her exercise routines. Mrs. Erike wanted us to know that she made friends here at the Water’s Edge and that with the full support from our staff, she felt confident to return back to her life at home!